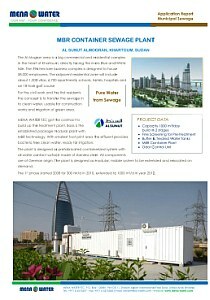 MENA-Water profile brochure includes company profile, business fields, product groups and reference projects. MBR Package Plant for Sewage Treatment – From Sewage to Pure Irrigation Water. – Complete plants from process engineering to plant operation. – control and monitoring for plant operation. Here you will find our brochures and reference sheets in several languages. This documents we offer as PDF-files. You will need any PDF-viewing program for reading.